Hellooooo, watermelon. Where have you been? Missed you! Watermelons are now in season, and I happen to love them. I also dig the cantaloupe and honey dew melons that start to arrive for a bargain in my supermarket and farmers market. Farmers' Market Desserts by my friend and cookbook author, Jennie Schacht, is the perfect book for those of us who have these markets near by and want tips on how to make spectacular desserts with the bounty. Jennie shared her "Mojito Melon Balls Recipe" with me and they were fun for me to make. Her recipe inspired me to buy a "melon baller" and then I proceeded to mangle both my watermelon and cantaloupe. The best ones are in the photo above - and I have to say I enjoyed myself trying to make melon balls. It turns out melon ballers are good for scooping cookie dough to make uniform cookies. I am going to use this tool again to help with portion control on my Insanely Delicious Chocolate Chip Cookies. 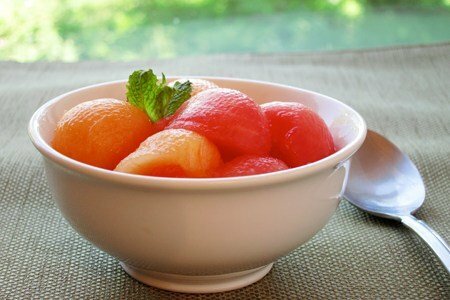 This melon ball dessert is low in calories but also incredibly nutritious with about 40% of your daily value of vitamin C per serving. The sugar, mint, rum, and lime make the melons sparkle. You can skip the alcohol in this recipe and it won't that much of a difference to the overall flavor. For those who like rum, you get the experience of a Mojito without all the calories. Yum! The rest of Jennie's book has inventive ideas for all that produce that you are going to see this summer and fall. The desserts are more for the adult palate (not too sweet) and the photos of the food are dreamy. Her recipes, for example Individual Summer Berry Puddings, Chilled Plum Soup, and First Prize Peach Pie, will inspire you to get to your farmers market pronto. Do you have favorite summer desserts that you can't wait to make? These refreshing mouthfuls of melon bathed in mint, lime, and rum are the perfect way to cool down on a hot summer day. I like to double the recipe for the mint syrup (without lime or rum) and refrigerate half of it in a sealed jar to perk up summer iced tea or for tossing with other fruits. This dessert is best served the day it is made. Season to Taste: Substitute locally available melons and experiment with herbs from your market or your own garden. For a refreshing red, white, and blue finish to a Fourth of July barbecue, use watermelon and a white-fleshed melon and replace a cup or two of the melon with blueberries. Farm Journal: Melons prefer a long, warm, frost-free growing season, making the South the preferred region for cultivation. California, Texas, Georgia, Arizona, and Florida are the primary states for commercial crops. But melons have been spotted at farmers’ markets in many other states, from Oregon, Minnesota, and Illinois to North Carolina and New York. Depending on the location, the earliest melons are harvested in April, with the season peaking in July and August and continuing in some areas nearly through the end of the year. Combine the sugar and water in a small saucepan over medium heat and bring to a boil, swirling the pan to help dissolve the sugar. Boil for 1 minute to dissolve the sugar completely, then remove from the heat and stir in the mint leaves and the rum. Let cool to room temperature, about 20 minutes. Strain the cooled sugar syrup through a fine-mesh strainer held over the melon balls, pressing on the leaves to extract as much flavor as possible. Add the lime zest and juice and toss to coat the melon balls evenly. Cover tightly and refrigerate for several hours until very cold. To serve, toss the melon balls again to coat. Scoop the balls into dessert glasses along with a spoonful or two of the juices. Stack the mint leaves for garnish, roll up tightly lengthwise, and cut crosswise into fine ribbons. Thinly slice the lime crosswise into rings. Just before serving, scatter the mint over the melon and decorate with the lime slices. Snack Girl receives a small percentage of sales from links to Amazon.com and Barnes & Noble. Summer anyone? This dessert screams it! Thank you! Also found that Polar Seltzer makes a Mojito Mint seltzer - 0 cal, 0 sodium - not quite like the real thing, but enjoyable -- seem to have lots of new flavors in the 1 liter bottles. What a great and refreshing recipe Yum! I have to try this! That photo is super. You can taste that melon. Hey Snack-Girl -- thanks so much for the shout out. Indeed, it's high time to pull out the melon baller (cool tool, right?) and make some Mojito Melon Balls for the holiday weekend! I was just wondering, is the sugar really needed? Can I use stevia instead?